With faith, family, and a focus on the future, Harrells Christian Academy strives to build Christian character, develop minds, and achieve academic success. From kindergarten through 12th grade, HCA strives to educate children and young adults who value integrity and commitment and who realize that the moral and intellectual domains of our lives blend into one another. HCA creates an environment that encourages commitment to education, respect for diversity, and the value of approaching life with confidence and enthusiasm. HCA is committed to excellence in the intellectual, personal, social, and physical spheres. The classic model of a college preparatory school allows HCA to grow effective, successful and exemplary members of a complex society. Intellectual development is a continuous process where formal education provides individuals with the opportunities necessary to mature and develop their intellectual curiosity and skill throughout adulthood. Sequential teaching materials, a variety of learning media, and community resources are integral parts of the curriculum. All those who guide students in their development understand our students' 21st century world and its influential forces. Harrells Christian Academy seeks to prepare students to become productive and responsible citizens by fostering their social development, promoting their physical and mental well-being, building their moral and ethical values, and imparting to them democratic attitudes and a sense of civic duty. Within limitations, every effort is made to provide for students' individual differences. These differences enhance other students' intellectual and social development--collectively and individually. We believe that students and faculty should continue to learn, explore, and move towards wisdom and understanding throughout their lives. 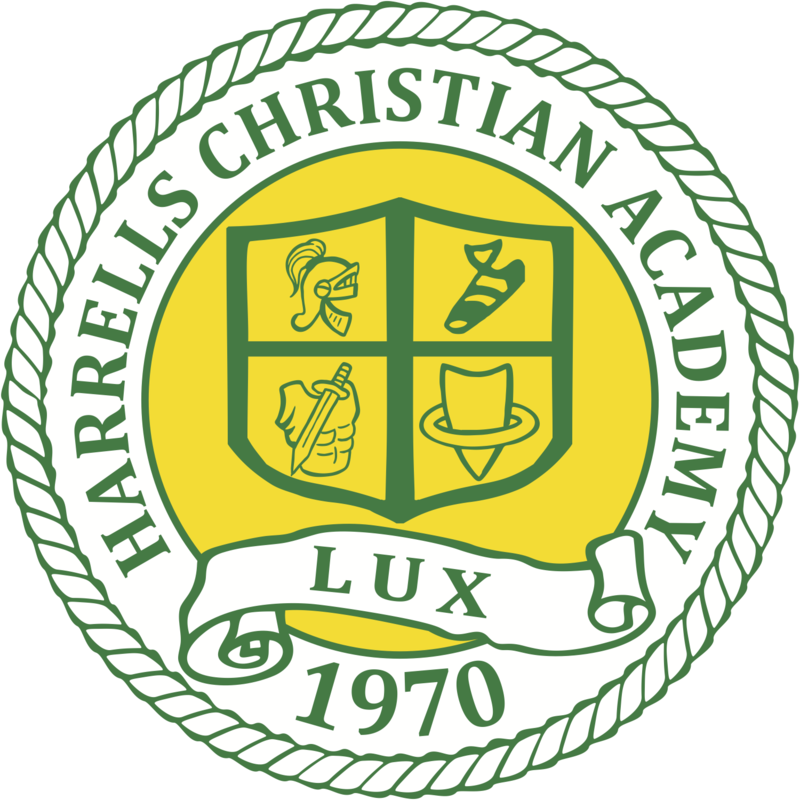 Harrells Christian Academy was founded in 1970 and the school seal is based on Ephesians 6:14-18. Stand therefore – hold your ground- having tightened the BELT of truth around your loins, and having put on the BREASTPLATE of integrity and of moral rectitude and right standing with God! And having shod your FEET in preparation to face the enemy with the firm-footed stability, the promptness and the readiness produced by the Good News of the Gospel of Peace. Lift up over all the covering SHIELD of saving faith, upon which you can quench all the flaming missiles of the wicked one. And take the HELMET of salvation of the SWORD the spirit wields, which is the Word of God! PRAY AT ALL TIMES – on every occasion, in every season – in the spirit, with all manner of prayer and entreaty. LUX is the LIGHT of the world.